Preventative maintenance is a term more common to industry than to residential or office floor care, but its importance cannot be over-emphasized. Good preventative maintenance lengthens the intervals between the major renovation operations such as recoating and refinishing. 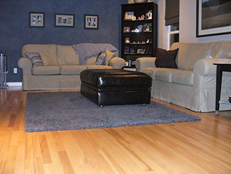 Polyurethane, Swedish finish, and water based Swedish finish are a no-wax, n-oil (soap) finish. For general cleaning of soiled areas, dip or spray a clean cloth with warm water or manufacturer’s recommended cleaner. Use dirt-trapping mats at all exterior doors to help prevent dirt, grit, and sand from getting inside. Throw-rugs or small sections of carpet with soft backing just inside the entrance are also recommended. Dirt and grit are any flooring’s worst enemy and that includes carpets and vinyls as well as hardwoods. Keep door mats clean. In kitchens, use area rugs at high-spill locations and at work stations—stove, sink, and refrigerator. Cotton is generally the best fabric since it is easily washed. Mats with smooth backing, i.e. rubber or vinyl may trap water beneath. In the first two weeks of a newly finished floor, area rugs must be kept off floor and do not mop for seven days. Put fabric glides on the legs of your furniture, as they allow furniture to be moved easily without scuffing the floor. Clean the glides regularly since grit can become embedded in them. Some furniture may require barrel-type roller casters as ball-type casters may cause damage. Grey, non-marking rubber casters are the best. Avoid casters made of hard materials like metals or hard plastics. Vacuum regularly, as often as you vacuum carpets. A brush attachment works beautifully. Sweep or use a dust mop daily or as needed, but do not use a household dust treatment, as this may cause your floor to become slick, dull the finish, or interfere with recoating. 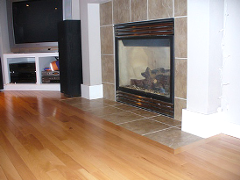 Taking good care of hardwood flooring will increase the longevity of your floors. Contact us today in Western Washington, to learn more or to request an estimate.